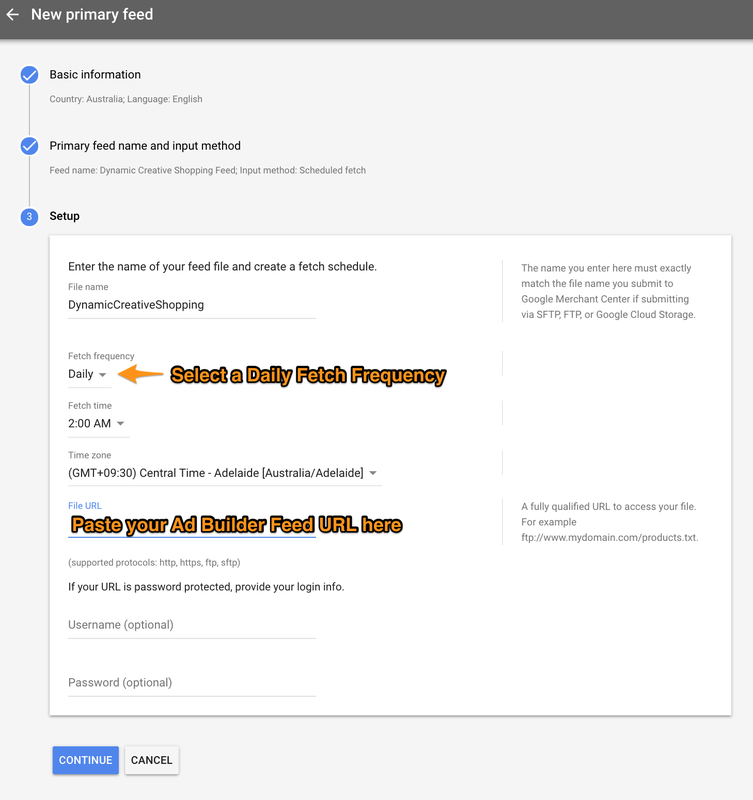 In order to advertise your products in Google, you must upload a Google Product Feed to the Merchant Center account linked to your Google Ads account. 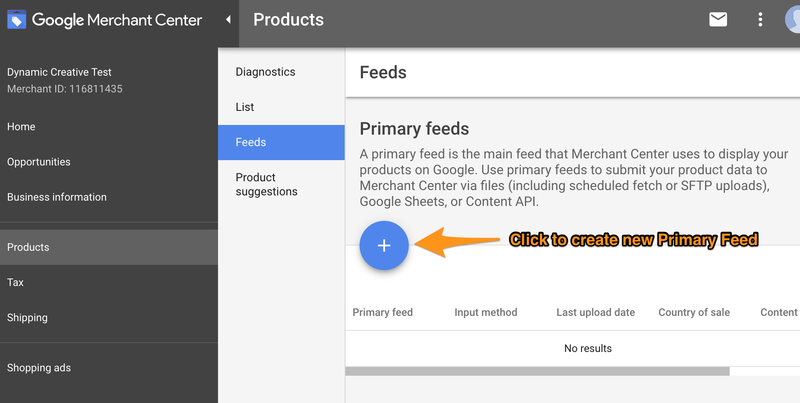 If you have not already created a Google Merchant Center Product Feed, refer to our guide on Creating a Google Merchant Center Product Feed before continuing with this guide. First, navigate to your advertising feed card on your website overview screen and copy your feed URL. Your feed URL is available through the feed URL button on your advertising card highlighted in the screenshot below. Fill in the appropriate information on each step. On step 2, select Schedule fetch as the input method. On step 3, ensure you have set the Fetch Frequency to Daily and paste your feed URL in to the File URL field (see screenshot below). Note: We recommend a daily fetch time of 2:00AM, GMT +09:30. Note: You do not need to enter a username or password. Once complete, click Continue to save your feed. 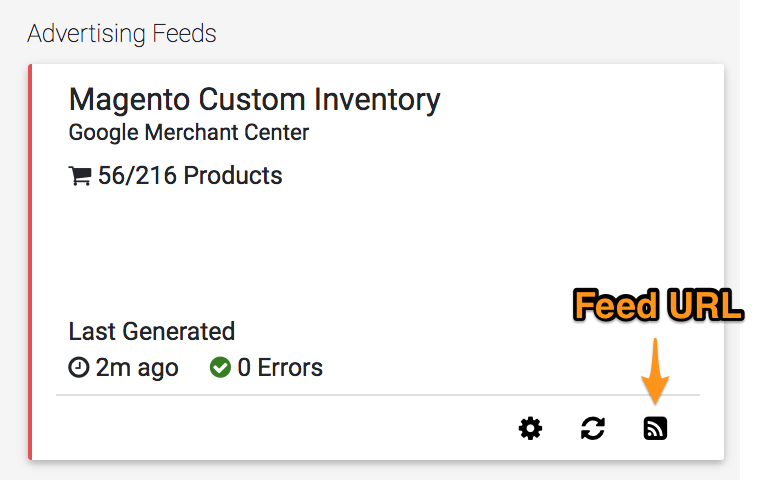 Google Merchant Center will now process your products and notify you of any errors/warnings relating to your product data. In order to advertise your products in Google, you will also need to generate and publish a Google Shopping Campaign Ad Build. If you have not yet created a Google Shopping Campaign Ad Build see our Creating a Google Shopping Campaign guide.